This glove was made for and used by Pham Tuan. Pham was the first Asian cosmonaut in space on the Soyuz 37 which was launched on July 23rd, 1980. The SOKOL space suit was designed in the early 1970s to protect cosmonauts during launch and landing or unexpected emergencies. It has an attached pressurized hood with hinged plastic visor securing to blue anodized aluminum clavicle flange, trussed sleeves with adjustable articulating cables in upper arm and webbed belt lashings. There is a pressure gauge on the left sleeve. The gloves were detachable from the rest of the suit. The K type suit was the first variant of the SOKOL series introduced in 1973 as a result of the Soyuz 11 tragedy. After entering the suit, the cosmonaut would seal the bladder with a rubber strip. The outer layer was then closed off using nylon string (later suits introduced in 1982 shifted to a Zipper closure. Here are side views of the gloves. Note the blue metal locking rings on the bottom. 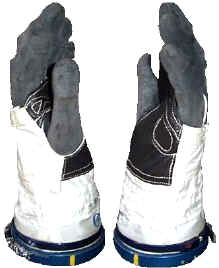 Here is what the gloves look like when attached to a complete Russian SOKOL Space Suit. It also has a double V front zip closure, lace-up crotch, aluminum umbilical interfaces on body for electrical, air and coolant line with cables and hoses. Here is our SOKOL Glove on display at the South Florida Science Museum in West Palm Beach, Florida. On 29 Jun 1971, Cosmonauts Dobrovolsky, Patsayev and Volkov died during re-entry. A valve in their Soyuz Decent Module malfunctioned at the moment of separation from the orbital module, and all of the air escaped from the capsule resulting in the deaths of all onboard. The K type suit was strictly designed for launch and landing protection against rapid cabin decompression however in an emergency the Soviets claimed it could be used for EVA to transfer from one disabled spacecraft to another. The basic construction consists of an inner pressure bladder which is entered via the chest. 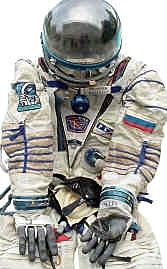 In June, 2003 we were fortunate enough to actually acquire an authentic, Russian SOKOL KV-2 Space Suit. These suits are extremely rare outside of Russia and only a very few are known to exist in the United States. Click Here to view our Authentic SOKOL Space Suit. "Science & Technology Centers & International Space Collection"